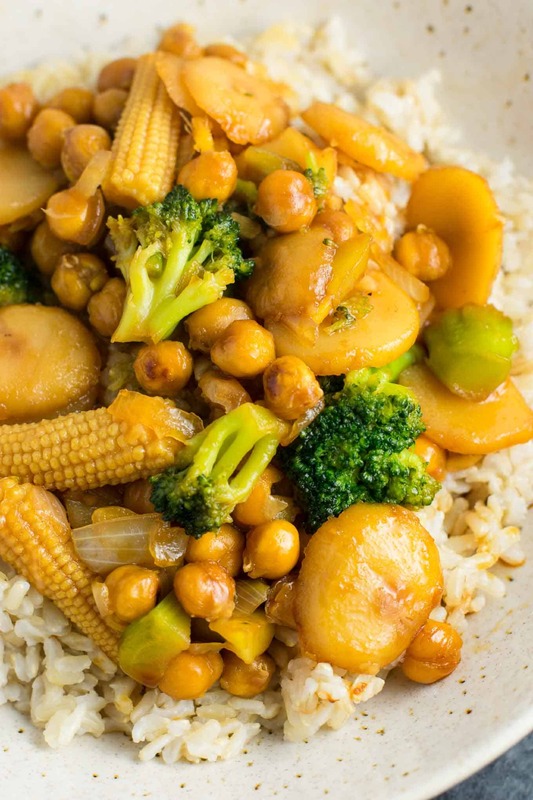 Today we’re cooking this vegan chickpea stir fry recipe. 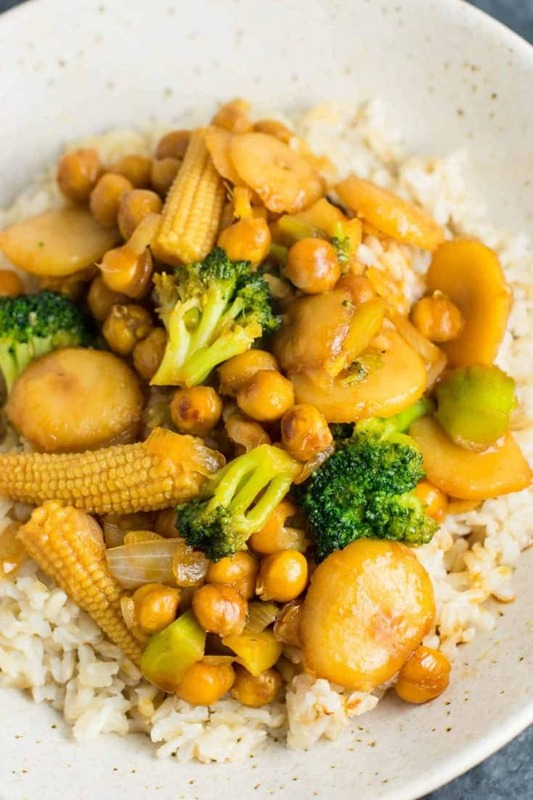 It is full of good for you ingredients, meatless protein, and topped off with a delicious homemade 3 ingredient stir fry sauce that will change your life! Growing up, my family used to order Chinese after church every single Sunday. It was a tradition that still continues to this day. We always ordered the same thing every week. I loved Chinese food! Once I started to eat healthy, I realized that what I’d been eating all those years was not very good for me. 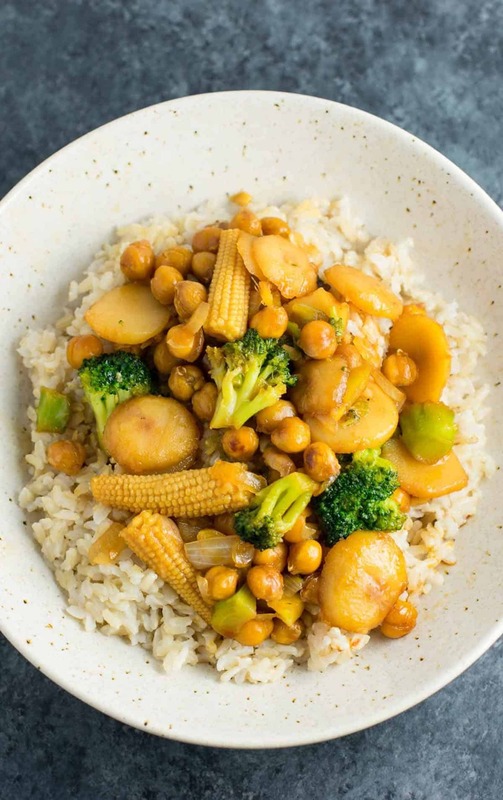 While I still enjoy my occasional out-to-eat fix, this vegan chickpea stirfry bowl is one healthy way for me to satisfy my cravings! 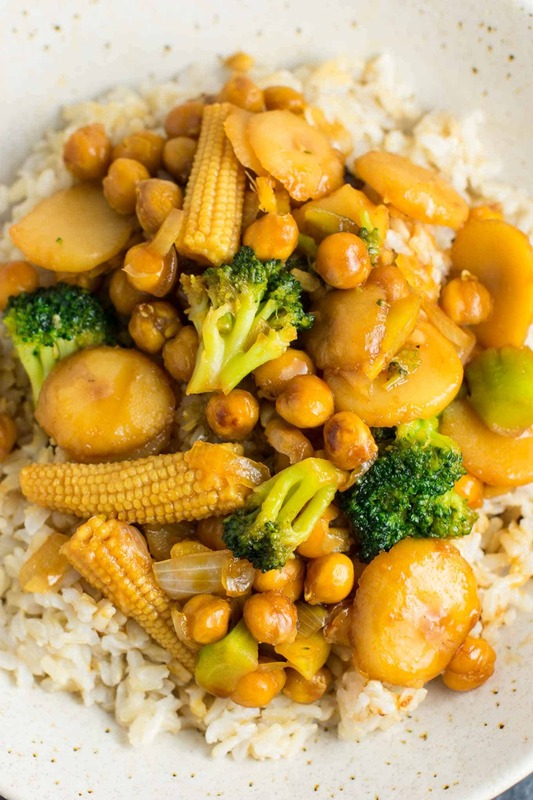 Making stir fry at home is not only more healthy, but actually tastes incredible! Once I cracked the code on how to make delicious takeout style recipes in my own kitchen, it was life changing. 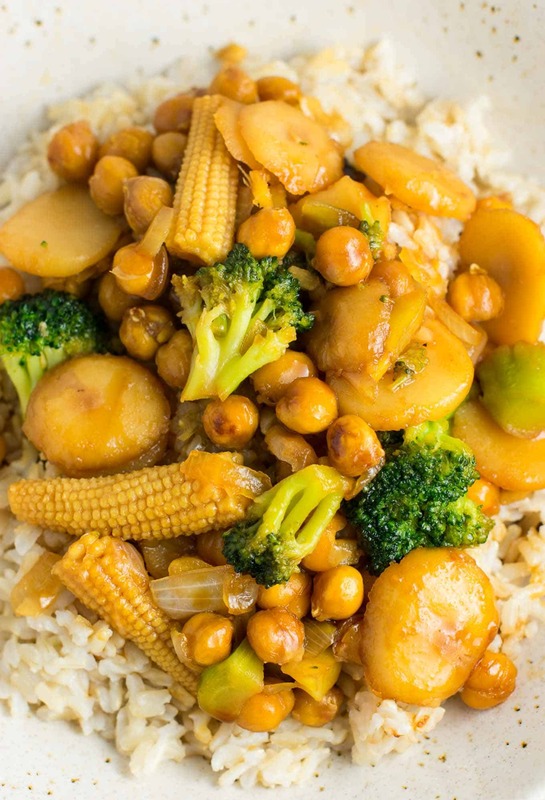 For this recipe, I used some of my favorite veggies to order when I get takeout. I love using water chestnuts in stir fry recipes. They are so crunchy and really make me feel like I’m getting that out-to-eat experience. The water chestnuts have always been one of my favorite parts of takeout chinese food! 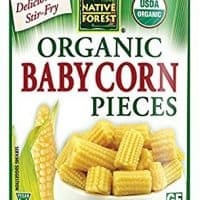 I also added in baby corn just like my favorite Chinese restaurant does. I love the texture that it adds! You can find cans of baby corn and water chestnuts at your local grocery store in the oriental section. 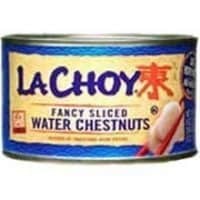 Be sure to grab the pre sliced water chestnuts to cut down on prep time! All you have to do is drain and throw it in the skillet. First, I roasted chickpeas for the protein. I also chose brown rice for serving. I honestly forget sometimes how much I love brown rice. Not only is it healthy, but it’s seriously delicious! I don’t even miss the white rice at all. The key to the flavor of this recipe is in the fresh garlic, ginger, and onion. It took me a lot of trial and error to come up with my stir fry sauce recipe, but it was absolutely worth it! I never make a stir fry recipe without it now. 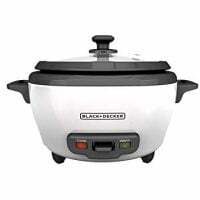 I use it in stir fry vegetables, broccoli with garlic sauce, 30 minute chickpea stir fry, and my broccoli tofu stir fry. To say I am obsessed would be an understatement! You’ve gotta try it! Stir fry sauce + garlic + ginger + stir fry veggies and protein of choice and magic happens. So delicious! Try this recipe next time you’re craving takeout, it’ll satisfy your cravings without the guilt and excess calories! Stir fry is one of my favorite recipes to make! 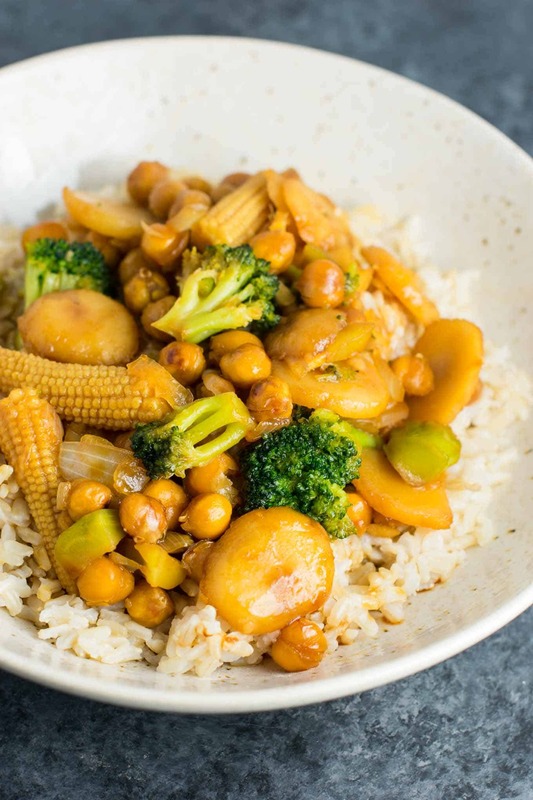 Here are all of my stir fry recipes, posts, and tips and tricks for making delicious takeout style recipes in your own kitchen! Are you making this recipe? I want to see! Don’t forget to tag your recipe photos on instagram @buildyourbite and hashtag #buildyourbite! Once chickpeas are done, add them to the skillet mixture and stir. Did you thaw broccoli first? You can thaw the broccoli if you want, but I usually just toss mine in and it defrosts pretty quickly in the hot skillet. I had this for supper last night and it tasted incredible!! The homade teriyaki sauce was delicious too. Thank you so much!! So glad you enjoyed it Tiffany! So glad you enjoyed it Amanda! How much teriyaki sauce do you use? Just came across your recipe on Pinterest and like the previous poster Camille, I don’t see a quantity for the sauce in the Ingredient List or Instructions. Can you please enlighten? Thank you! My apologies for the confusion! The recipe links to a post with a homemade stir fry sauce in it, and that is the one I recommend making. If you simply use store bought sauce instead, you can add the sauce to taste, and will probably end up using around a cup, give or take a little. Hope that helps!